OK, OK, I admit it.... I wanna be there right now! 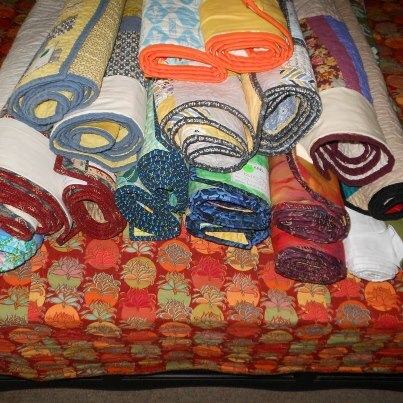 My head is spinning from browsing the #quiltcon instagram pictures (the ghetto way - on statigram since I have a "dumb phone") and seeing all the people that I virtually know and admire. The quilts, booths, lectures and classes not to mention the unofficial festivities - I can pull off the 80's look, honest.... oh yes, I'm green with envy -neon green. 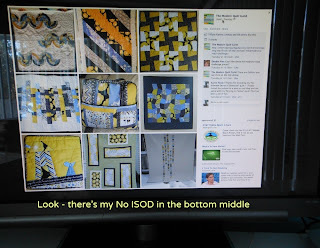 Fortunately, several of the blogs I follow have been taking time out to post so I could sneak a peak like A Quilting Jewel and Mommy's Nap Time and upload to flickr like Anne@PlayCrafts. I'm SO EXCITED for our MQG president, my friend Tina for winning Judge's Choice for "Adrift" in the Use of Negative Space category. 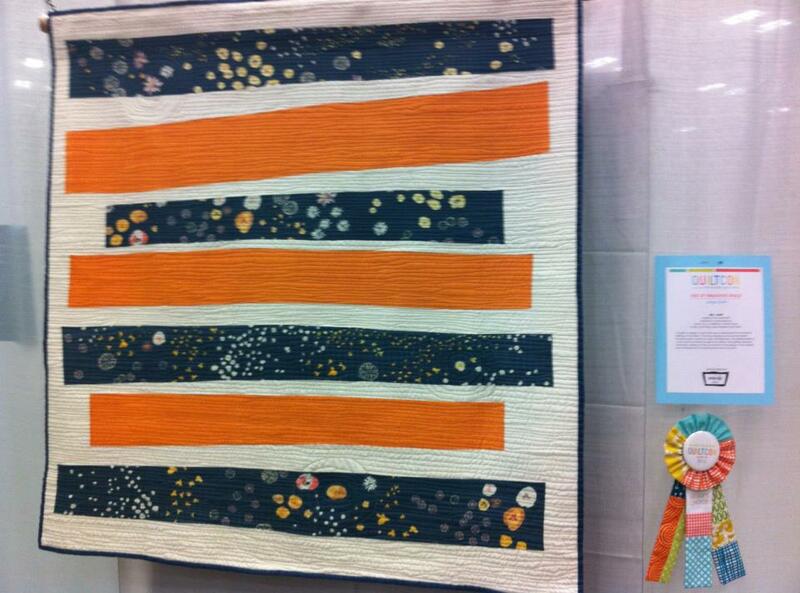 She is amazingly talented (obviously) and I'm thrilled that she was recognized by those in the know. 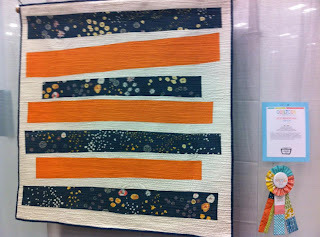 Christa Quilts has a series of posts showing the quilt winners. No need for me to pout at home. 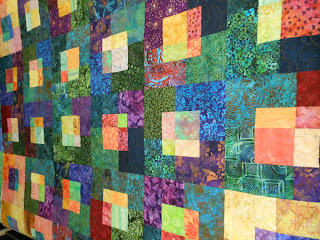 I'm having an exciting weekend helping out with our local PVQA quilt guild show. It's the 35th annual and this group knows how to get it done! 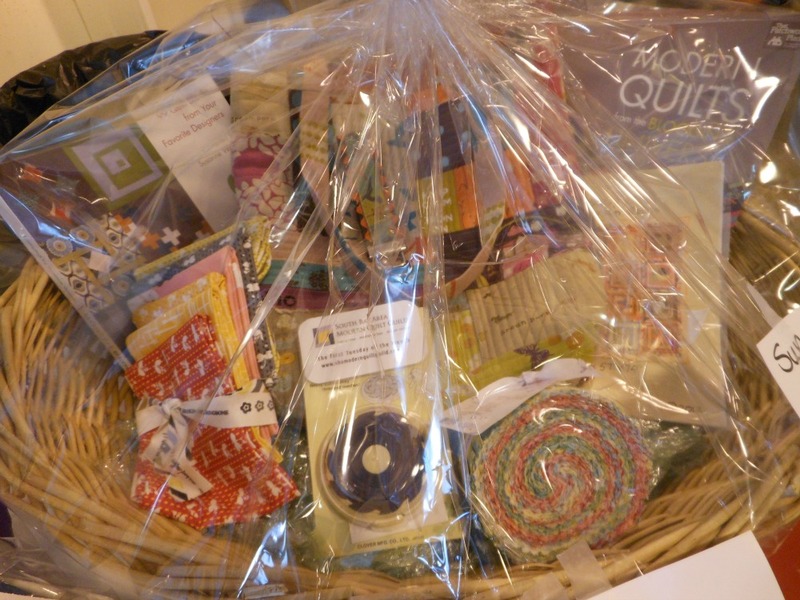 We donated a basket for the raffle that has proven to be quite popular. 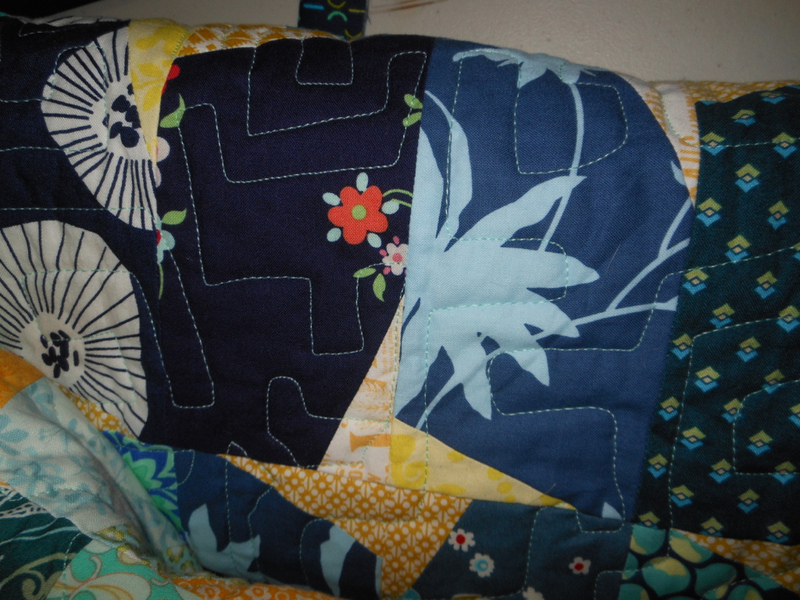 You may recall I made an Echino Tote which is easier to see in person than this photo. Friday was busy with set up in the day and the pre-view party in the evening. 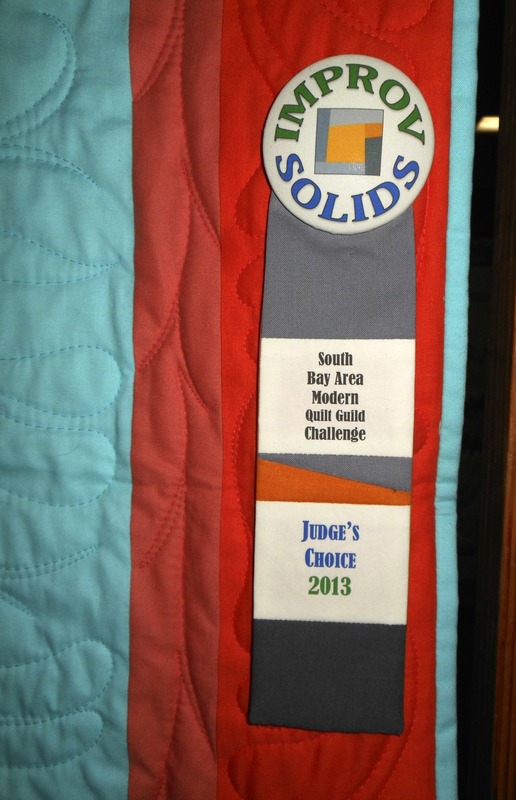 This year that included the judging the SBAMQG Modern Improv in Solids challenge. There were 7 entries, all terrific and I've heard from several participants that they enjoyed the process of making their quilt. The Ribbon I made is not as fancy as the ones Elizabeth Hartman created for QuiltCon. 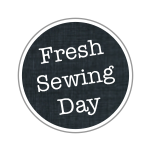 We used a jumbo sized button and photo fabric keeping it minimalistic. The concept of fitting our square logo onto a round shape had baffled me in the design process, but I'm pretty please with the result. 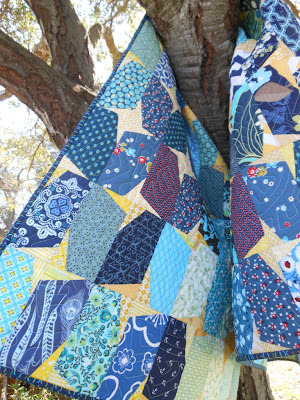 I'll be revealing a picture of the winning quilt on our blog soon. I also surprised my sister at the show with a quilt which I can now officially rename "Luminosity for Linda". Previously posted bout it here and here. She loved it. 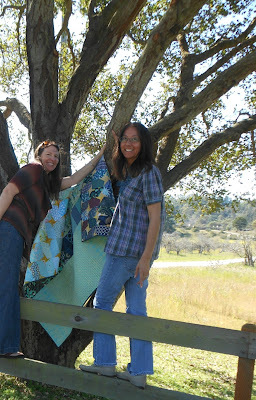 Me & My Sister at PVQA show "Luminosity for Linda"
Before this reveal, she had spotted my quilt named "Sisterly Love" (pictured below) that I made for our other sister (also a surprise). In my most snarky tone I teased her "That's not for you"..."but if you'd like to see the one that is, follow me". 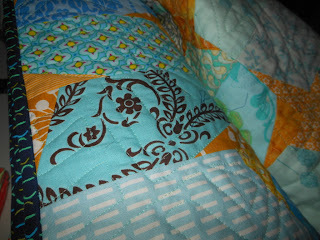 EDIT: Linking up to FAL Q1 with Leanne of She Can Quilt as one of the 6 of 7 qualifying projects done. 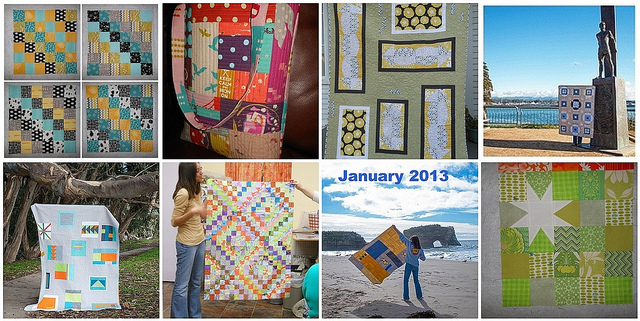 1) No Inherent Sense of Direction 2) Tassels 3)Driving in Circles 4) Luminosity 5) Sisterly Love 6)QuiltCon Charity. Original Goal post here. 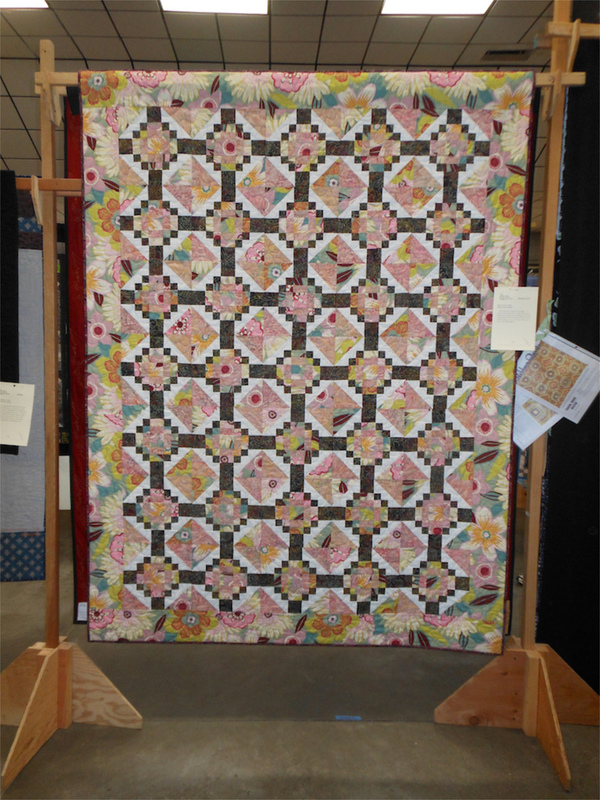 More to share from the show - but I've got to dash off and enjoy it some more before it's time for heavy labor to break it down this evening. 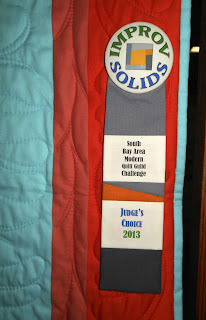 Photos of the SBAMQG Modern Quilt entries found here. 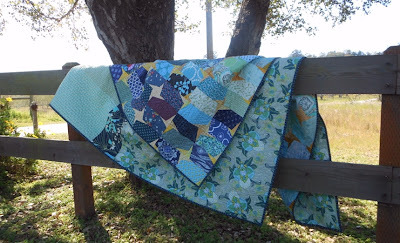 I usually write a specific post for WIP Wednesday but the guideline does say to link to one from the week so that's what I'll do. 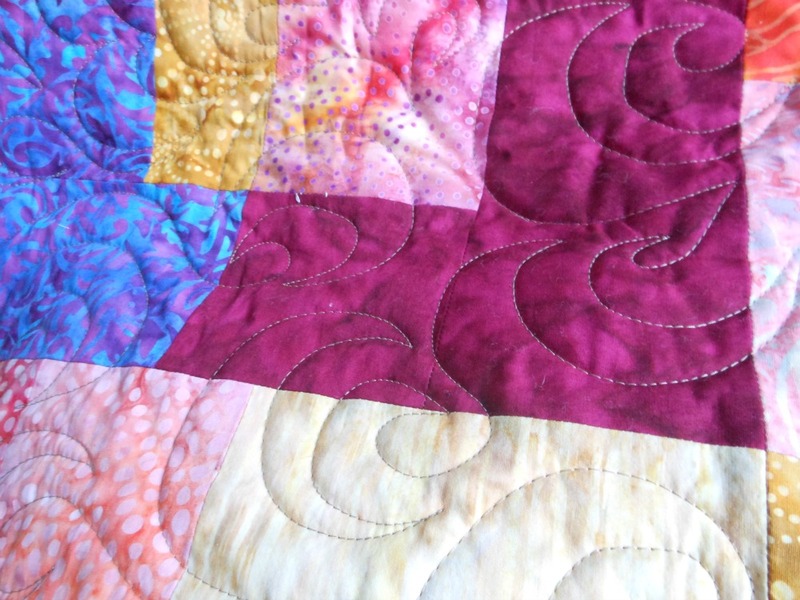 Congratulations to Lee at Freshly Pieced for taking 1st prize with her Lifesaver's quilt. 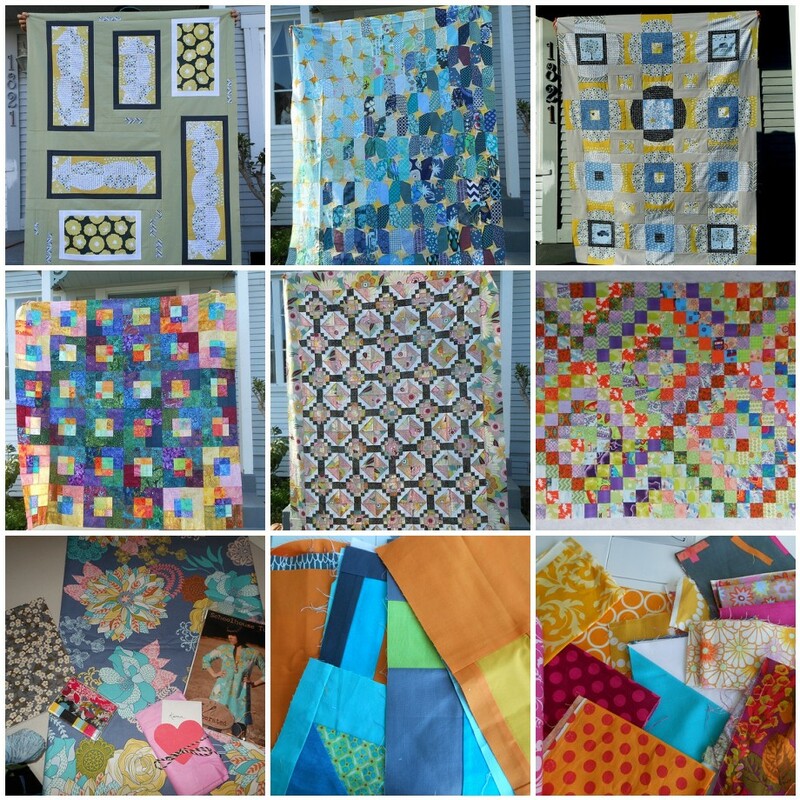 With the local quilt show and all of the browsing online about QuiltCon there hasn't been much progress on my WIP list since last week and I'm sure I'm not alone. 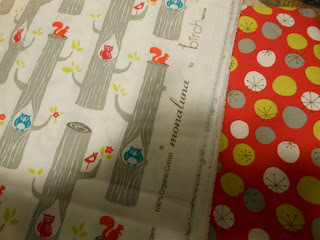 The tote swap is a secret so I can't share pictures of my progress so I will leave you with some fabric eye candy - organic cotton is so yummy. First of all... safe journey to all of those lucky ducks headed to QuiltCon. I really want to pack myself in a check on and join you but no, not this time. 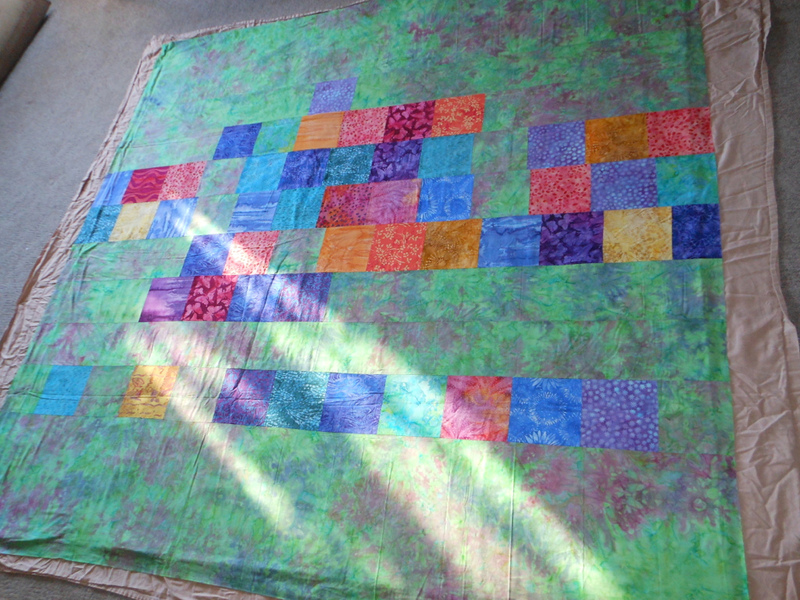 I'm hoping to see pictures of the Charity Quilts hanging and am excited to have been a part of that. 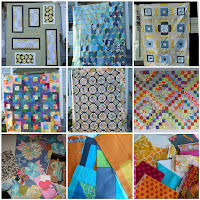 Thanks to the deadline of our local PVQA quilt show, I've got lots on the finished list today. The To Do list is still quite large with 48 hours until the "by" date of three but it all seems more manageable than it was last week. I also had the wonderful opportunity to play a bit on FMQ on a couple of small pieced for a friend. Her quilts are amazing and she gave me a nice long low-pressure creative leash about what to do. I'm pleased with the results. Linking up to the new and improved WIP Wednesday at Freshly Pieced. Tassels - Complete, a photo by capitolaquilter on Flickr. Well here it is - so exciting to share this quilt. Thanks to an amazing - and wonderfully exhausting day with friends I have a photo shoot to share. This time it wasn't the beach/redwoods tourist trek like with the QuiltCon charity quilt with Anne but rather the picturesque meadows with Sue. Tassels has been a long time coming since the tutorial and deserved a proper introduction to the world. 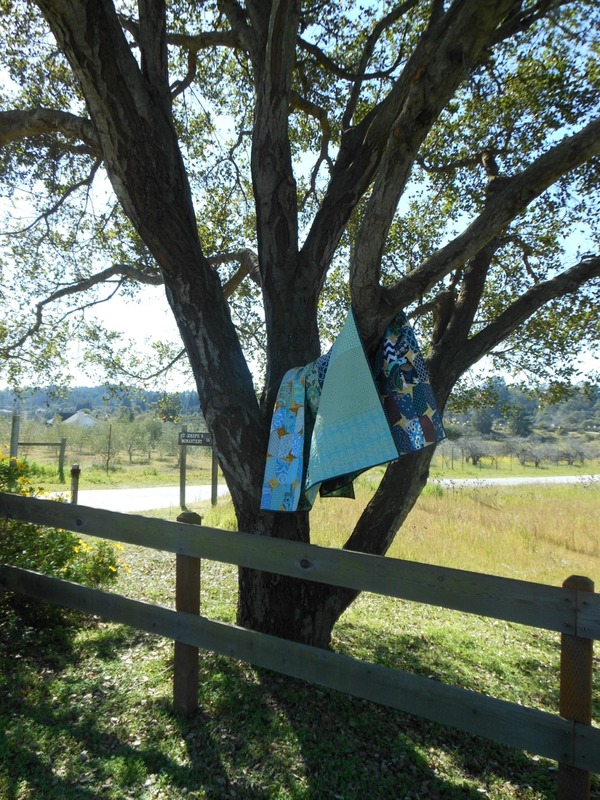 The gorgeous blue sky and open fields of Corralitos was the perfect setting. 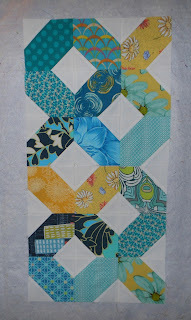 Thank you Friends+Fabric=A Modern Stash Bee from April 2012 for all of the great blocks. 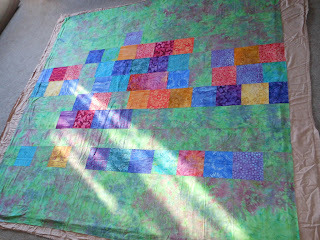 Linking up to Finish it Up Friday at Crazy Mom Quilts and TGIFF at Sewing by Moonlight. Previous Tassel posts here, here and here. Officially off the list! The completion is especially sweet because this poor quilt rolled from one quarter of Finish-Along to the next and then into January AND February of A Lovely Year of Finishes. 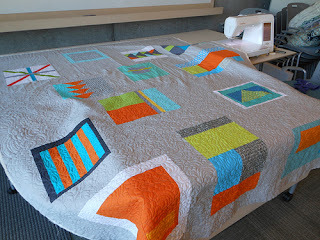 EDIT: Linking up to 2013 FAL Q1 with Leanne of She Can Quilt as one of the 6 of 7 qualifying projects done. 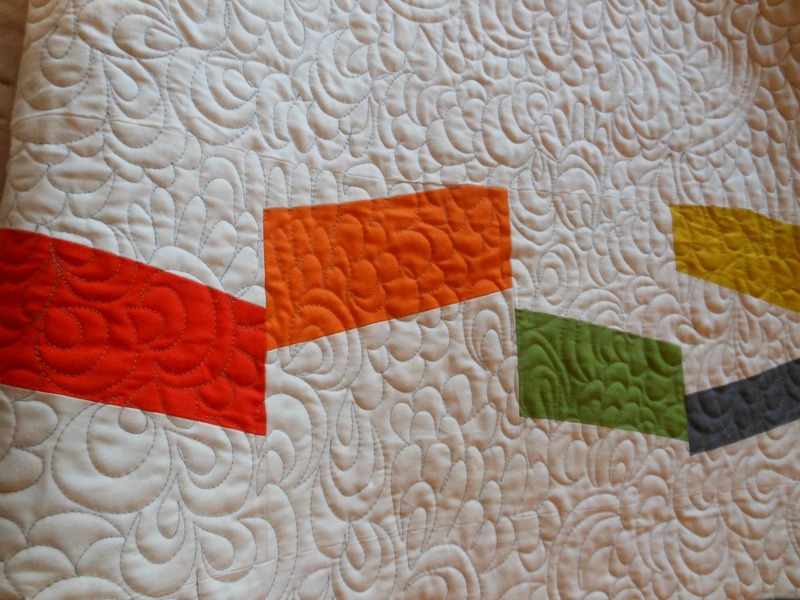 1) No Inherent Sense of Direction 2) Tassels 3)Driving in Circles 4) Luminosity 5) Sisterly Love 6)QuiltCon Charity. 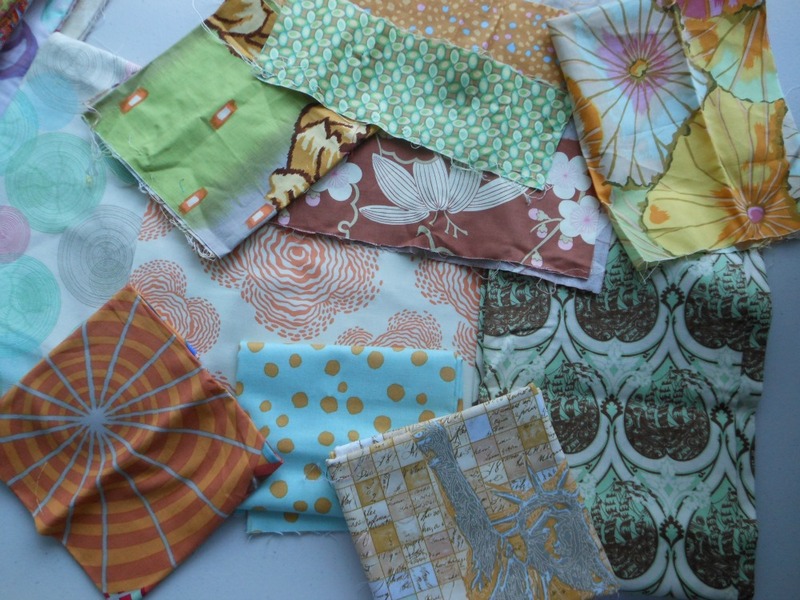 Since my last post I've had the honor of meeting some wonderful (and pretty darn famous) Fabric Designers. 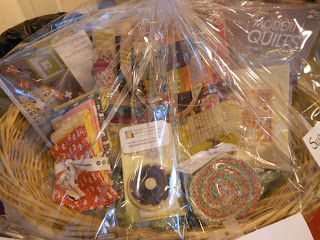 Oh, and to sweeten the story...I won stuff too! 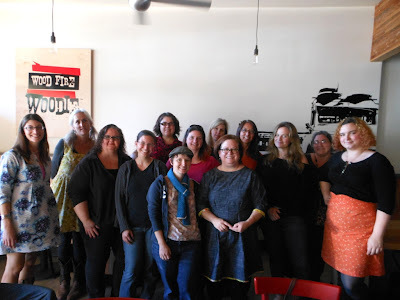 Last Monday, we had a private lunch at the amazing Wood Fire Woodie in Scotts Valley with the one and only Heather Ross - pinch me! 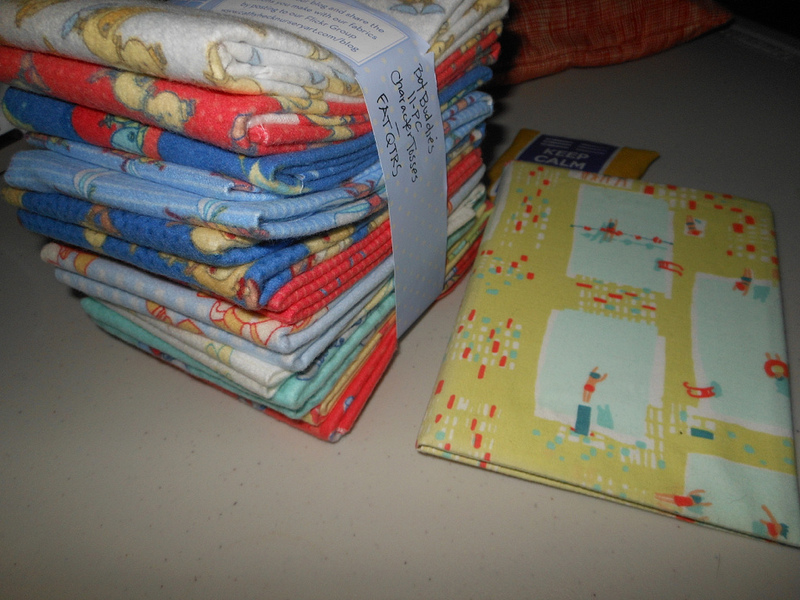 She even brought us some goodies which were distributed at our MQG meeting the next night. 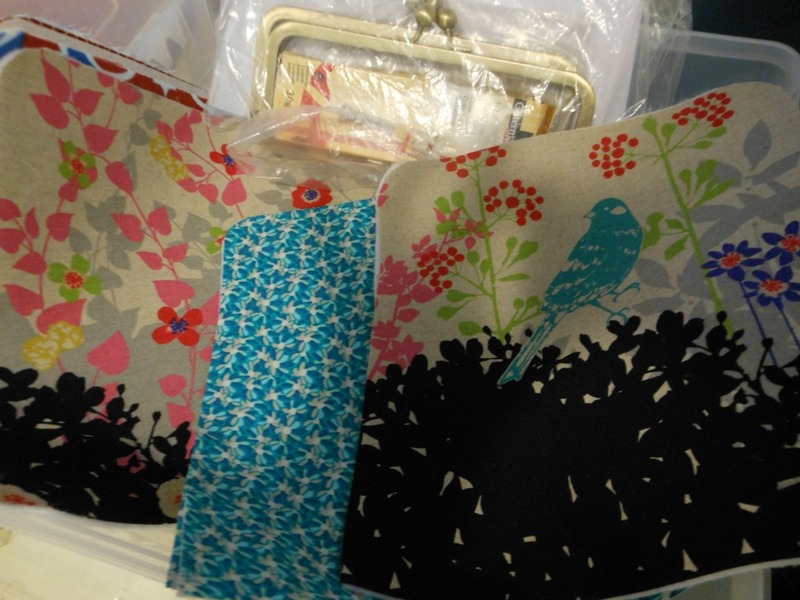 My name was drawn and I chose a fabric covered photo album with the cutest swimming pool fabric I'd never seen before. She also chatted with my friend and I at Hart's later that night and autographed my new Prints book. 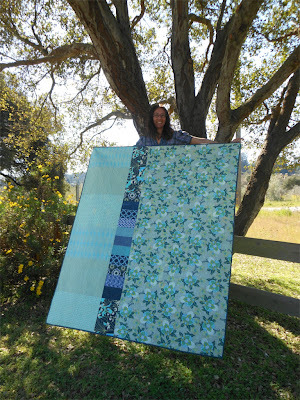 So talented and personable, it was such a treat to spend time with Heather Ross. Read more here. 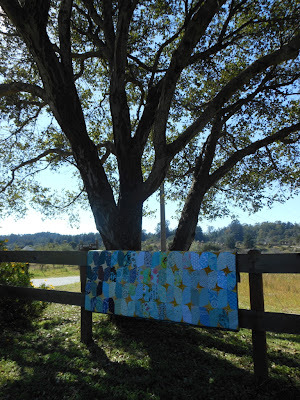 Then on Saturday I took a trip to see Stitch Modern, East Bay Area MQG's Quilt Show at the beautiful Piedmont Center for the Arts and listened to the Q&A Panel of Textile Design featuring Ellen Heck, Pati Fried, Sandy Klop, Jennifer Moore and Carol Van Zandt. There were lots of giveaways - lucky me, I won an 11 FQ of Bot Buddies flannel. 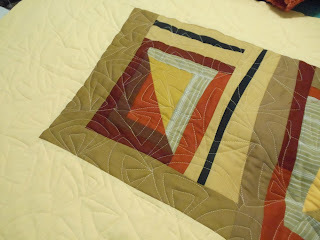 Using Aurifil 40 for the first time and trying out a new sort of geometric design, I managed to make it through quilting Tassels. With the gradient nature of quilt, the stitching is more prevalent in the darker areas but I like it pretty well. The binding hit the mark and I'm super please with the choice. Originally I was thinking scrappy but there is a lot - a lot - going on and this seemed a better fit. 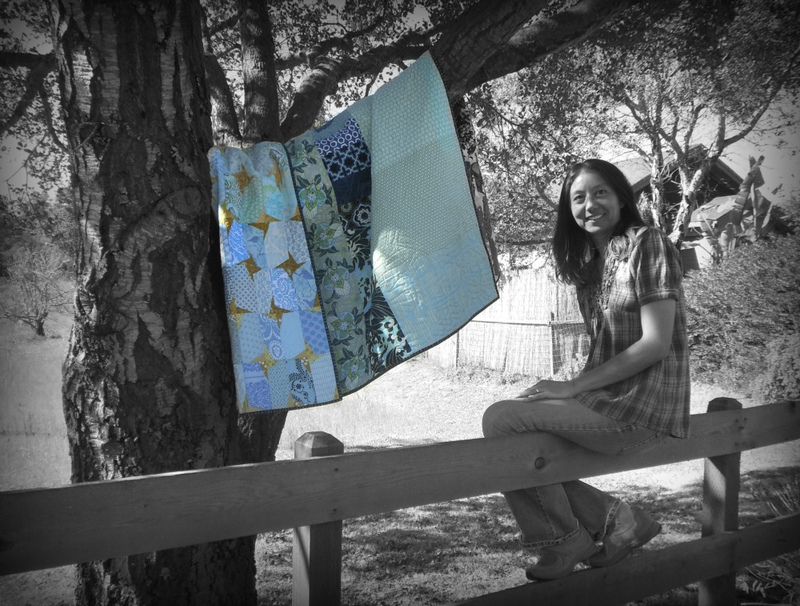 January 2013 mosaic: Fresh Sewing Day, a photo by capitolaquilter on Flickr. The New Year has been a whirlwind of deadlines and of pushing the envelope for me. 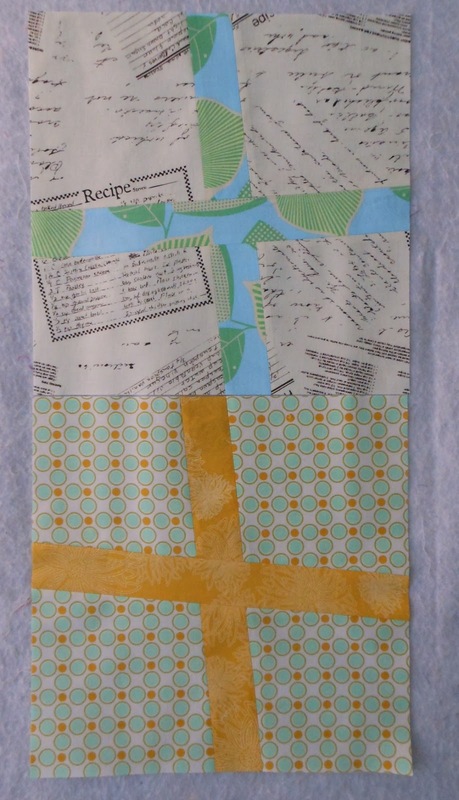 I managed to mail off my bee blocks on time even though they aren't all shown in the mosaic. A lot of FMQ and finishes for me with the QuiltCon charity and both of my Madrona Road #1 Madrona Road #2 challenge quilts completed. I've never spent as many hours behind the machine as I did in January. Bonus is that all three were on my 2013 finish-a-long list so now I'm 1/3 of the way to my Q1 goal. This month was a social one with two Sew Days and during a Sew Date I dabbled with a metal frame purse that will hopefully come to life in February. I'm pretty please with it all which feels good. Linking up to Lily's Quilts. 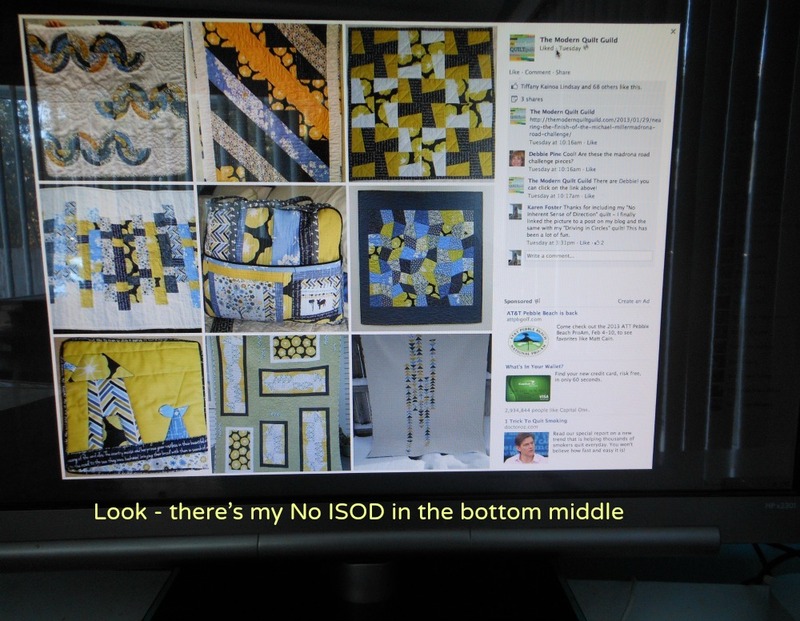 I discovered the "share" button on flickr while my photostream is open. I swear I learn something new every day. When I hit the button I thought only the top row of pictures was going to show up - oh well, much more to learn apparently. I crack myself up! Next month our local Quilt Guild will be having their 35th annual show. PVQA is a wonderful resource and I enjoy the lectures and workshops. 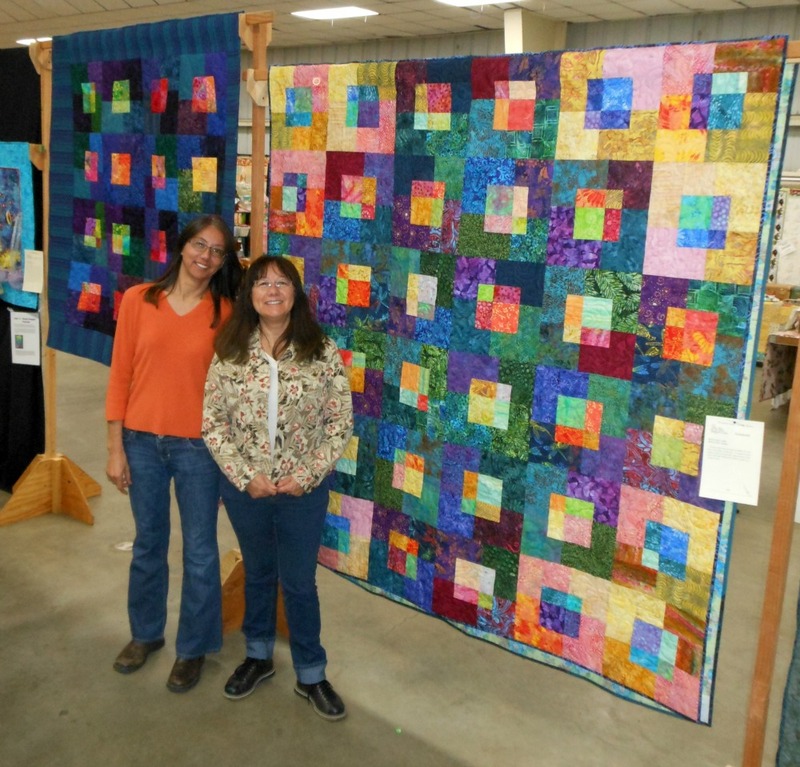 They have embraced our Modern Quilt Guild inviting us to exhibit again this year. 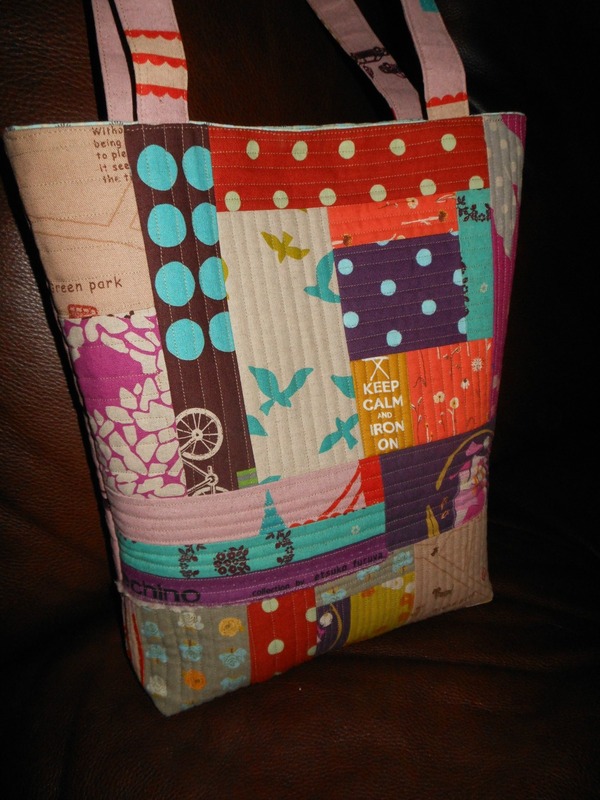 SBAMQG is in the process of collecting goodies for a donation basket at the show and I thought a QAYG Echno tote would be nice to make. There are bits of other modern fabric scattered in and it is lined with a lovely Art Gallery. My other finish was "No Inherent Sense of Direction" blogged about in full detail here. How dorky am I that I took a screen shot of the MQG's facebook page when they included it?! Did you make the deadline the selection is stunning. 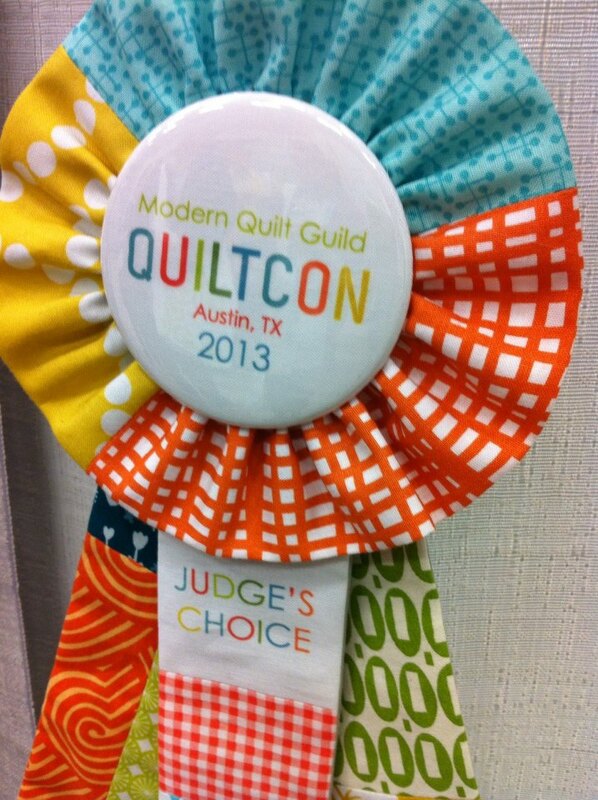 I'm so proud of our MQG member and the work they produced - way to represent! For something new... I had the pleasure of pulling some dusty fabrics for Linda's F+F2 February blocks, a very exciting chance to try out a new technique of circles. 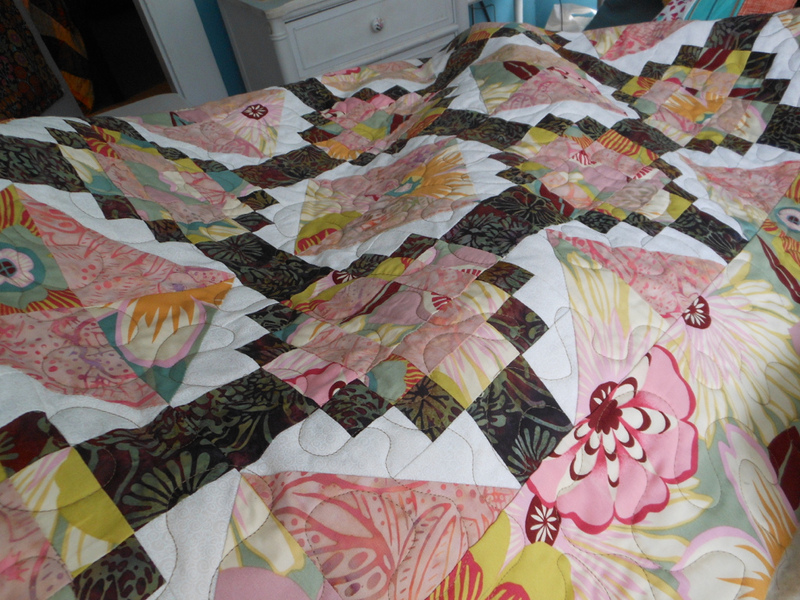 She makes the most amazing quilts and has the best taste (because it reminds me of mine LOL). I also have Deb's modified Road to Tennessee block fabric to pull for February MoStash but since it's aqua and yellow those are still haven't been put away from Tassels so I'm good to go. More on the horizon but tomorrow I get to play in San Fran with some friends with a trip to the DeYoung Museum. Last time I was there I shared this Sidewalk to Catwalk post. 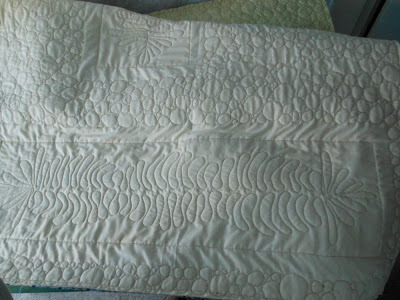 All this time later, I'm still amazed and inspired and unfortunately I'm still not a garment sewist either. 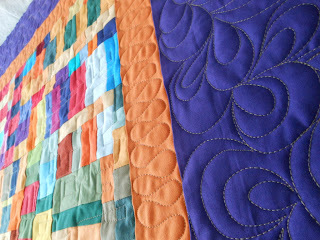 A couple of my friends from MQG are lucky ducks and spending the weekend with the fabulous Heather Ross and Gertie. Wish I could have pulled off going but I'll have to live vicariously through them - have a blast Anne & Julia!